Verne Global owns and operates a 44-acre data center campus in Keflavik, Iceland. The strategic location provides availability to the world’s two largest data center markets, Europe and North America, while also addressing some of the most critical challenges facing today’s data center landscape. 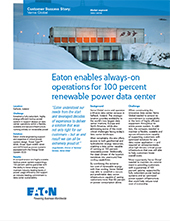 Most remarkably, the site offers access to both geothermal and hydroelectric energy resources, enabling a data center capable of running on 100 percent renewable power. Additionally, the ideal climate of the location translates into year-round free cooling capabilities.